This article describes what needs to be done to have a SSL ( HTTPS) enabled site on CentOS 4.5. This should work on other distro’s as well but i have not tested. 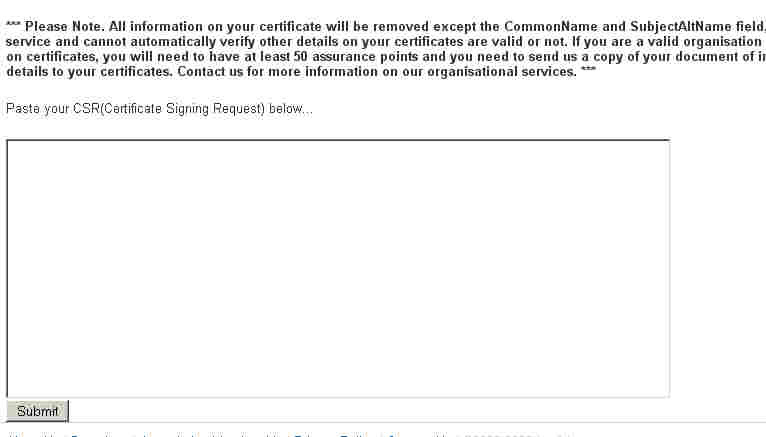 Generate a CSR ( Certificate Signing Request ). The CSR must be signed by private key “my.key” generated in the step 1. Please note you must enter at least your domain name as highlighted below in bold. Now you need to take mysite.csr to a Certificate signing authority to get your SSL Certificate. I used a free Certificate authority named CAcert.org . Very highly recommended by open source community. But the issue is that many mainstream browsers do not automatically recognize CAcert. So for first time visitors, a warning will pop up. Just accept it permanently. After this, the pop up wont show when ever you visit from the same browser. First signup with CACert. Once done, then go to the next step. Cacert will do a domain verification by sending an email to your registered email address. Open your email and click on the link sent to you by the CAcert. Then Click on “Server Certificate ->New” to get a new certificate for your site. Configure SSL options in httpd.conf file. Configure Php 5.2.x build options. If any of the packages are missing, configuer script will spit out an error. Install those packages and re-run configure script as above until it is successful. For example, if libpng is not installed in your system, configure will abort. Then install libpng and re-run configure.